Born and raised in Old Hickory, Tennessee, Nate Bargatze has been following in his magician father’s footsteps on the long road to entertainment gold. 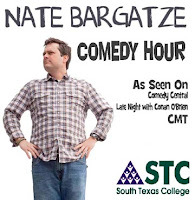 Bargatze made his television debut on the “CMT Comedy Stage” in 2007 and has been a fast-rising star on the national comedian scene ever since. In addition to hosting his own “Comedy Central Presents” special, Bargatze has performed on “Late Night with Conan O’Brien” twice. He has also written for Spike TV’s Video Game Awards. When he isn’t winning comedy festivals in New York and Boston, he’s performing for troops in Iraq, which he has done four times. Now he is bringing his comedy to the Rio Grande Valley in a special performance at South Texas College’s Starr County Campus Building E Auditorium on Thursday, Nov. 3, 2011 at 12 p.m. The building is located at 142 FM 3167 in Rio Grande City. Admission is free and open to the public. For additional information contact STC’s Student Life Department at 956-872-3535. 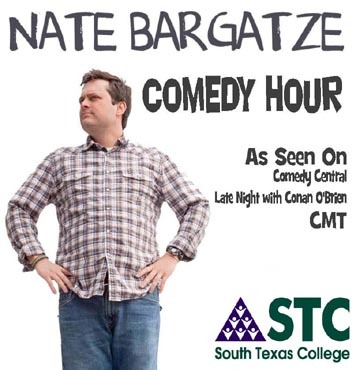 Comedian Nate Bargatze to perform at STC’s Starr County Campus Nov. 3, 2011.